A 360º film at WEG provides a virtual reality experience for spectators to experience for themselves the importance of Brooke’s efforts for working equines around the world. For some horses, life is a far cry from the sparkling glamour of the equestrian competition world, but these equines from “the other side of the tracks” are getting their turn in the spotlight with a 360° video at this year’s FEI World Equestrian Games. An interactive experience in the World Equine Expo at Tryon International Equestrian Center (TIEC) by official WEG charity Brooke shows the reality of life for people and equines in South Asia’s brick kilns through 360° video presented in a circular, immersive room. Brooke USA, sister charity to Brooke, is raising funds through a newly installed Brooke Breezeway onsite at TIEC, with engraved bricks humanely manufactured in the United States available for purchase in support of this effort. In developing countries around the world, 100 million horses, donkeys and mules work alongside people in some of the most difficult environments. Brick kilns are perhaps the most punishing of these. With thick dust, temperatures of up to 50°C (122°F), and very little shade, animals suffer from breathing problems, injuries and malnutrition. The families that own and rely on these animals are often in bonded labor and have little access to vets, farriers, or first aid. There are around 4.7 million equines in Pakistan, and in the film Brooke has captured what life is like for those in brick kilns. It follows a young couple, Waqas and Tayyba, who live and work on the site of the kiln with their baby, Sania Fatima, and rely on their horse, Raju, for work. Waqas and Tayyba work alongside 50 families employed to produce 45,000 to 50,000 bricks per day. There is pressure to overwork themselves and their animals, but Waqas and Tayyba know that overworking Raju can cause injuries and exhaustion, and if he can’t work, their family will suffer. Through guidance from Brooke vet officer Dr Sabira Nazir, they’ve learned about animal care, preventing injuries and illness, and how to provide adequate water and food. This overloaded donkey is in it for the long haul, carting bricks from the kilns in India. The film is showing for the duration of the games at the World Equine Expo, and Brooke volunteers are on hand to answer questions. The installation will be combined with the unveiling of the Brooke Breezeway, a commemorative walkway at TIEC made of bricks bought and personalized by donors. The Brooke Breezeway will perpetually honor the lives of working equines around the world and the welfare improvements made possible for them by Brooke and Brooke USA. Engraved bricks humanely manufactured in the United States will be sold throughout the duration of the World Equine Expo and WEG for insertion into the Brooke Breezeway, and are also available online. 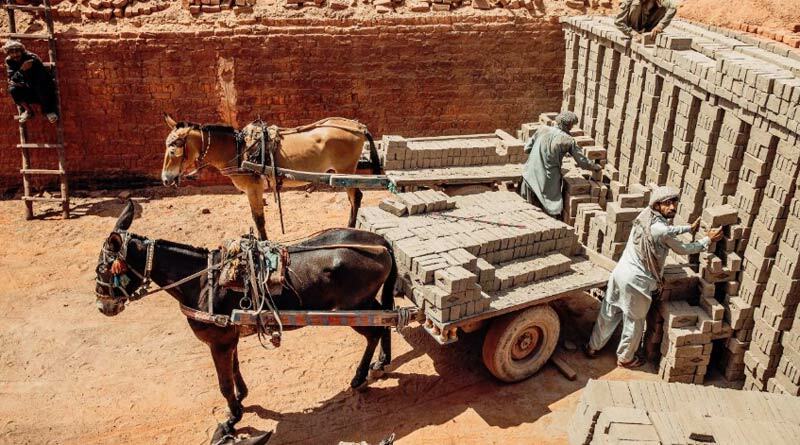 Proceeds from the sale of Brooke Bricks will benefit many of the 380,000 horses, donkeys, and mules who work in India’s brick kilns – a particularly harsh environment for equines and their owners. Extreme temperatures, lack of shade, difficult terrain and overloading can cause suffering for horses, donkeys and mules. Brooke works in 3245 brick-kiln sites offering emergency veterinary treatment and vaccinations for animals, as well as training for their owners and service providers on topics such as injury and disease prevention. The Brooke Breezeway will serve as a legacy of the Games, allowing all spectators the chance to take part in improving welfare for working equines around the world. Bricks can be ordered in memory or in honor of a beloved person, pet, favorite horse, company, to commemorate a special event such as a birthday or anniversary, or to give a company name and logo a permanent presence on this walkway.